Lovebirds (and school kids) have been signaling affection with these chatty candies since the era of hoop skirts. Eat your (emoji) hearts out. 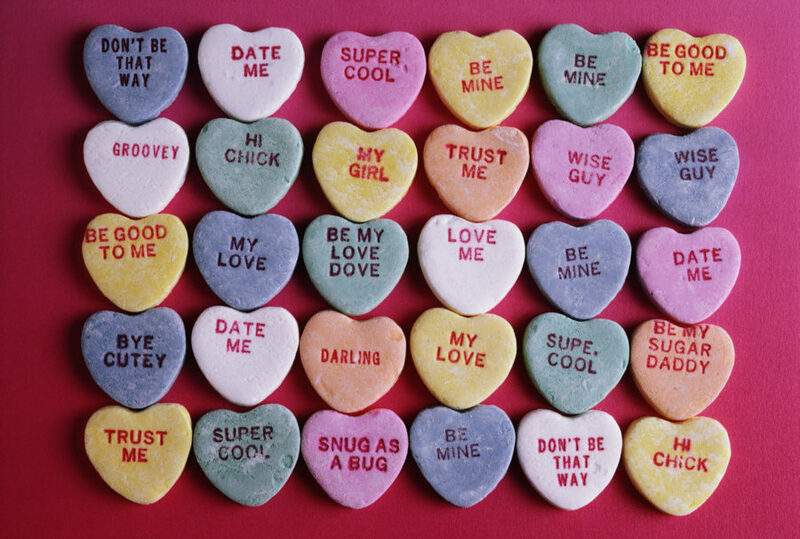 The forerunners of sweethearts were created by Boston candymaker Oliver Chase in the 1860s and bore little resemblance to the tiny schoolyard valentines we know today, says Mike McGee, the president and CEO of Necco, the company that manufactures Sweethearts. Early treats-with-a-message had a candy shell with a paper note inside (like a fortune cookie). In 1866, Chase’s brother Daniel had the idea to print messages directly onto the candy, which were large confections in the shape of baseballs, horseshoes, watches, and even–wait for it–hearts. With ample real estate for flowery language (see right), these confections served as icebreakers at adult social events, such as parties and weddings. In the early 1900s, the brothers’ company, the New England Confectionery Company (now Necco), decided to focus on miniature hearts and dubbed the treats Sweethearts. Be warned: The classic flavors–like the much missed wintergreen, banana, and cherry–are returning this year for Necco’s 150th anniversary and may spark a vivid sense memory of a childhood crush who was crazy 4 u. MAY I SEE YOU HOME AFTER THE CIRCUS?